(Phys.org) -- Providing a possible new route to hydrogen-gas production, researchers at the California Institute of Technology (Caltech) have devised a series of chemical reactions that allows them, for the first time, to split water in a nontoxic, noncorrosive way, at relatively low temperatures. Hydrogen is a coveted gas: industry uses it for everything from removing sulfur from crude oil to manufacturing vitamins. Since its combustion does not emit carbon dioxide into the atmosphere, there is some belief that it could even fuel a potential "hydrogen economy"an energy-delivery system based entirely on this one gas. But since there is no abundant supply of hydrogen gas that can be simply tapped into, this lighter-than-air gas has to be mass-produced. 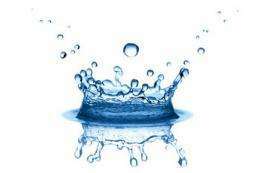 One way to make hydrogen is by using heat to split water, yielding pure hydrogen and oxygen. Known as thermochemical water splitting, this method is appealing because it can take advantage of excess heat given off by other processes. Thus far, it has been attempted in two ways: using two steps and taking advantage of high temperatures (above 1000°C) associated with solar collectors; or through multiple steps at "lower temperatures"those below 1000°Cwhere, for example, the excess heat from nuclear reactors could drive the chemistry. Davis is interested in this latter approach, which actually takes him back to his academic roots: his first paper as a graduate student dealt with a low-temperature water-splitting cycle, called the sulfur-iodine system, which has since been piloted for use around the world. Although that cycle operates at a maximum temperature of 850°C, it also produces a number of toxic and corrosive liquid intermediates that have to be dealt with. The cycle's high-temperature counterparts typically involve simpler reactions and solid intermediatesbut there are very few processes that produce excess heat at such high temperatures. More information: The PNAS paper, "Low-temperature, manganese oxide-based thermochemical water splitting cycle" is now online. The work was funded by a donation from Mr. and Mrs. Lewis W. van Amerongen. Dig down. Plenty of heat there. I think it's interesting that the raw minerals they list could be extracted from seawater. With sufficient solar energy, desalinization for potable water and hydrogen production could be a fairly effecient integrated process. "there is some belief that it could even fuel a potential "hydrogen economy"an energy-delivery system based entirely on this one gas. But since there is no abundant supply of hydrogen gas that can be simply tapped into, this lighter-than-air gas has to be mass-produced." Hydrogen might only release water when combusted, but its tremendous drawbacks in physical characteristics for storage and transportation makes it an awful carrier for energy. If CO2 from the air is used to construct a fuel, then its release when combusted is not an issue. Nature has show the way to harness Hydrogen, stick it on some Carbon. Non-fossil renewable hydrocarbon fuels will win the day because you just cant beat the convenience and efficiency of high energy liquid fuels. but surely, if we had a cheap enough supply of it, copper pipes could take it most of the places it needs to go. Think! I'm in Australia so I can only fantasise about this, but USAmericans could access a couple of thousand years worth of heat energy for their whole bl**dy country by burrowing down around the sides of the heat mass under Yellowstone National Park. NOT into the top mind you because that would set the damned thing a-blasting, which would kill the lot of you. Water filled mine shafts dug down twenty Km away from the really hot rocks by remote control machines could get down far enough to avert any such danger. Horizontal drilling and mining inwards from there could access all the heat energy you will ever need.